This guide covers Wellington City only. 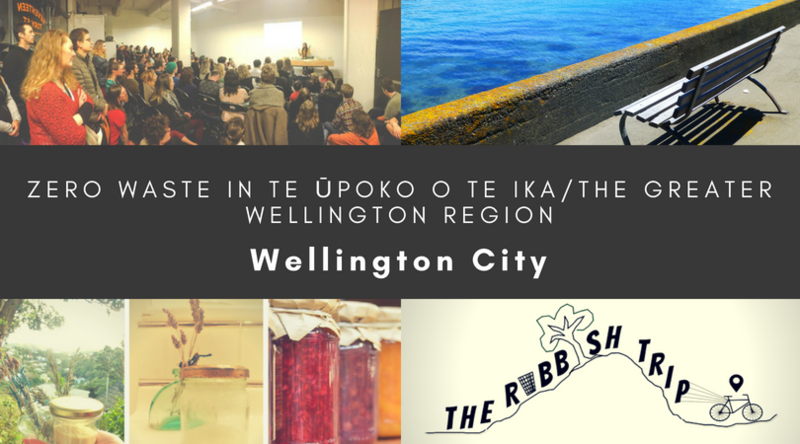 For other parts of the Greater Wellington Region, please refer to the Zero Waste in the Greater Wellington Region homepage. Hopper Home Eco Shop, 11 Hopper Street, Te Aro, Wellington City – a wonderful zero waste refillery run by the founders of Waste-ed. The store stocks a range of dried and liquid foods in bulk dispensers, including grains, flours, pasta, nuts, seeds, legumes, dried fruit, muesli, condiments, spices, vinegars, oils, honey and even chocolate in bulk. The store is also working hard to reduce its own waste, sourcing as much as possible from local suppliers who refill the store’s dispensers, e.g. local Wairarapa EV olive oil in a refillable steel container (rather than olive oil from far overseas that comes in a single-use plastic bladder)! If there are things you’d like to see stocked that aren’t stocked yet, just have a chat with the staff, who are very receptive to suggestions! Commonsense Organics, 260 Wakefield Street, Te Aro; 37 Rongotai Rd, Kilbirnie; 96 Johnsonville Rd, Johnsonville – offers a wide array of dried food in bulk bins (including, but not limited to, nuts, seeds, cereals, grains, flours, legumes, herbs and spices), liquid foods (including vinegars, oils and tamari – note that in some stores you need to ask at the counter for refills as the oils etc. are kept out the back). They even offer free cups of tea – just bring a reusable cup! Moshim’s Foodmart, 2-6 Wilson Street, Newtown – offers a wide range of unpackaged dried food in bulk bins, including grains, flours and legumes, and lots of spices, as well as some hard-to-find items essential for zero waste living, such as baking soda, salt and other specialty baking/cooking goods. Newtown Green Grocer, 100 Riddiford Street, Newtown – good range of affordable bulk bins stocking grains, legumes, spices, snacks, nuts, seeds, dried fruit. Manga the Foodstore, 218 Riddiford Street, Newtown – another great range of dried foods at very affordable prices. Unfortunately, Manga recently decided to remove their bulk bins in favour of pre-packing their goods in ziplock plastic bags. However, they were happy for us to continue bringing our own bags and containers to fill either directly from out back of the shop or from their ziplock bags which they then reused. It’s always worth asking! Silk Route Spices, 236 Riddiford Street, Newtown – stocks a decent range of legumes, as well some peanuts and rice, in bulk bins. The Spice Emporium, 31 Coutts Street, Kilbirnie – stocks a wide range of unpackaged dried food in bulk bins, including grains, flours and legumes. The Nut Store, 284 Cuba Street, Te Aro – quality nuts, seeds, fruit and spices sourced as locally as possible. Most things are pre-packed in cellophane (which is compostable), but if you drop off your own bags outside of their peak lunch hours (11am-2pm), they can fill them up for you to pick up later – just let them know the quantities you require. V1 Vegan Store, 207 Cuba Street, Te Aro – most things are packaged in this small specialty shop, but they have 3 small bulk bins containing vitamin b12-enriched nutritional/savoury yeast, textured vegetable protein (tvp) and vital wheat gluten. There are also unpackaged vegan lollies in stock, just BYO bag/jar! Moore Wilson’s, corner of Tory Street and College Street, Te Aro – most bulk items are packaged here, but they do sell large brown paper bags full of different flour and huge glass jars of olives and the like which you can stock up on. An industrious person on our FB page also noted that Moore Wilson’s sells 1kg blocks of fresh brewer’s yeast wrapped in paper – you can cut this into cubes, freeze in 2 tsp portions and when you need it, defrost ahead of time and use as you would dried yeast – wow! Indian Spice Land, 189b Willis Street, Wellington CBD – most of what is in this store is packaged, but you can get rice and flour from bulk bins here. Yan’s Supermarket, 28-30 Hopper St, Wellington – sells loose egg noodle nests. Harriet and George Organic Produce and Wholefoods, 5 Collins Avenue, Linden – get tamari on tap into BYO bottle here. Urban, Johnsonville Shopping Centre – unpackaged fudge, woohoo (BYO container)! Narayan Spices n Food, 10/6 McMillan Court, Newlands – stocks a good selection of bulk bin spices, condiments, grains, legumes, seeds, nuts, dried fruit, just BYO bags! Payal’s Spice Mart, 199 Main Road, Tawa – stocks a small selection of spices and condiments in bulk bins. Supermarkets – all major supermarkets in Wellington have well stocked bulk bin/pick and mix sections with wholefoods (BYO bags for these). However they’re pretty expensive, often more so than equivalent ingredients in packets (bah! ), and more so than the bulk bins at places like Commonsense Organics or Moshim’s. Unpackaged live mussels – there are a few stores around town that stock unpackaged live mussels at self-serve counters. We put them straight into upcycled ice cream containers/BYO containers rather than the plastic bags the stores usually provide. You can find unpackaged live mussels at PAK’nSAVE Kilbirnie, 98 Rongotai Road, Kilbirnie; New World Wellington City, 279 Wakefield Street, Wellington; New World Thorndon, 150 Molesworth Street, Thorndon; New World Newlands, Cnr Newlands Road and Bracken Road, Newlands. Hopper Home Eco Shop, 11 Hopper Street, Te Aro, Wellington City – on Fridays and Saturdays at Hopper Home Eco Shop you can get unpackaged, day-old Arobake bread that would have otherwise gone to waste, for a great price! So many wins right here! V1 Vegan Store, 207 Cuba Street, Te Aro – stocks unpackaged vegan pies, cakes and slices, just BYO bag/container. Markets – No two ways about it, if you want to get a good source of unpackaged, often locally grown, produce, markets are the place to frequent! BYO bags to get fresh produce from large markets at Newtown School on Saturdays, or at the Habourside market outside Te Papa and on the corners of Willis, Victoria and Vivian Streets on Sundays. For a smaller range of local, organic produce and artisan products, check out the Thorndon Farmers’ Market (aka Hill Street Farmers’ Market) on Saturday mornings. By and large, we’ve found that markets, where you can meet the grower/producer face-to-face, are really great for starting fruitful conversations about waste-free food, and developing relationships and systems that enable you to get your favourite fruit, vege and preserves without the packaging. Many of the Wellington markets have local producers of pre-made foods like tofu, noodles, preserves etc. Have a chat to see if you can leave containers with the stall holders for them to fill with your desired product for you to pick up from them the following week, or if the stallholder uses glass jars for packaging, ask whether they will take their empty glass jars back for sterilisation and reuse. Trade Aid – Trade Aid‘s 2kg sugar bags are also great for upcycling as bulk bin bags, and are home compostable when they do wear out. Trade Aid’s coconut oil is one of the few on the market that does not have a plastic seal around the lid. You can get these products at Trade Aid, 82B Victoria St, Wellington CBD or Commonsense Organics, 260 Wakefield Street, Te Aro; 37 Rongotai Rd, Kilbirnie; 96 Johnsonville Rd, Johnsonville. Coffee -Wherever possible, we recommend looking out for places that sell whole or ground coffee beans unpackaged, and bringing your own bag and container to fill. There are lots of options in Wellington – here are some of the places we know of, but you may have come across more: Raglan Roast, 40 Abel Smith Street, Wellington; Chaffers Dock, 18 Herd Street, Wellington; 12 Holland Street, Wellington (who are not only happy to put freshly ground beans into your BYO container, but for $10 you will get 200g of beans, as well as a regular coffee made up for you on the spot); Havana Coffee Works, 163 Tory Street, Wellington; Midnight Espresso, 178 Cuba Street, Wellington; Prefab, 14 Jessie Street, Te Aro; New World Wellington City, 279 Wakefield Street, Wellington; New World Thorndon, 150 Molesworth Street, Thorndon; and the Wellington City Commonsense Organics (260 Wakefield Street, Te Aro). Depending on stock, you may be able to find Peoples Coffee beans in bulk at Hopper Home Eco Shop, 11 Hopper Street, Te Aro, Wellington City. Tea – for the best range of different loose tea leaves in bulk, head to The Wellington Apothecary, 110a Cuba Mall, Wellington CBD. You’ll find Wellington based Ritual Tea on bulk at Hopper Home Eco Shop, 11 Hopper Street, Te Aro, Wellington City. The Kilbirnie Commonsense Organics store (37 Rongotai Road, Kilbirnie) stocks a selection of loose tea leaves in bulk too. Moshim’s Foodmart, 2-6 Wilson Street, Newtown, sells loose black tea leaves in bulk. Drinking Chocolate – your best bet is to go to any Commonsense Organics store and get Kokako drinking chocolate which comes in Econic home compostable packaging. Moshim’s Foodmart also stocks cocoa powder. Milk – Wellington finally has a glass refill system for milk! This is available through Eketahuna Country Meats at the Habourside market on Sundays – just BYO glass bottle or purchase one for $3 and return every week for a refill on site. They also sell their milk at the Riverbank market or at their shop in Masterton. Alternatively, look into MannaMilk, which is a raw milk company delivering raw milk all across the Lower North Island, including drop-off points throughout Wellington. The milk is delivered in single-use plastic bottles, which isn’t zero waste. HOWEVER, you can request that the milk be dropped-off in a reusable 10L pail, which you can pour into BYO bottles. As this is a large quantity of milk, you can either get a lot and freeze some, or go in with a group of others and share the milk and the cost between you. You can see MannaMilk’s delivery routes, days and drop-off points here. Otherwise, you can get milk powder from the bulk bins at Moshim’s Foodmart, 2-6 Wilson Street, Newtown and turn that into milk at home. If you aren’t a dairy drinker, did you know that Havana Bros Bake House, The BakeHouse 2/19 Arthur Street, Te Aro, Wellington sells almond mylk in reusable glass bottles? Simply return the bottle when it’s empty and they’ll sterilise and reuse it, so the bottles can go around and around (yay!) – they are actually so short of their empties that they have had to resort to plastic bottles, so make sure you do return any glass bottles! You can also find this almond mylk at Commonsense Organics, 260 Wakefield Street, Te Aro; 37 Rongotai Rd, Kilbirnie; 96 Johnsonville Rd, Johnsonville. You’ll also find some of the amazing Vigour & Vitality plant-based mylks at Hopper Home Eco Shop, 11 Hopper Street, Te Aro, Wellington City – this comes in paste/butter form (like almond butter for example) which you then add to water and either blend or froth up to become mylk. AND you can get some varieties in bulk here at Hopper Home Eco Shop, just BYO jar. Once empty, the bulk glass container is sent back to V&V to be washed, sterilised and reused – yus! Beer – much like coffee, Wellington is loaded with craft breweries where you can refill your own flagons and bottles (check out the extensive list here). Many liquor stores also stock craft beer on tap where you can refill BYO bottles – places like Regional Wines & Spirits, 15 Ellice Street, or at Glengarry’s, but keep an eye out for other places! There are also various bars that have off-licences so you can get beer straight from the bar taps into a flagon/bottle/rigger, such as Hashigo Zake, Basement/25 Taranaki Street, Wellington City; and Waitoa Social Club, 32 Waitoa Road, Hataitai. Other – find apple juice on tap (subject to availability) at Commonsense Organics, 260 Wakefield Street, Te Aro; 37 Rongotai Rd, Kilbirnie; 96 Johnsonville Rd, Johnsonville. Havana Bros Bake House, The BakeHouse 2/19 Arthur Street, Te Aro, Wellington, sell all manner of juices in glass bottles that, once empty, can be returned to them for sterilisation and reuse (yay!) – they are actual so short of their empties that they have had to resort to plastic bottles, so make sure you return any that you have! You can also find these products at Commonsense Organics, 260 Wakefield Street, Te Aro; 37 Rongotai Rd, Kilbirnie; 96 Johnsonville Rd, Johnsonville. NB: Many of the below items are stocked by The Hippie Straw – a local Wellington business focused on affordable reusables. They’ve got an online shop, but to avoid packaging cost/waste, find them and their products in person at the Harbourside Market on Sundays, and at the Wellington Underground Market on Jervois Quay. Say “no more” to disposable takeaway coffee cups and plastic water bottles by getting yourself reusables instead! Get reusable water bottles at Hopper Home Eco Shop, 11 Hopper Street, Te Aro, Wellington City (glass); Commonsense Organics, 260 Wakefield Street, Te Aro; Cre8tiveworx, 217 Cuba Street, Wellington CBD (metal); 37 Rongotai Rd, Kilbirnie; 96 Johnsonville Rd, Johnsonville (metal); Iko Iko, 118 Cuba Street, Te Aro (metal); Vessel, 87 Victoria Street, Wellington CBD (metal); Wellworks Pharmacy, 75 Taranaki Street, Wellington (metal); Tea Pea, 22 Ganges Road, Khandallah; The Gift Shack, 4/210 Main Road, Tawa (metal). Find the Keep Cup brand at Good House Keeping, 287 Cuba Street, Wellington; Commonsense Organics, 260 Wakefield Street, Te Aro; 37 Rongotai Rd, Kilbirnie; 96 Johnsonville Rd, Johnsonville; The Mediterranean Food Warehouse, 42 Constable St, Newtown, Wellington; and Sustainability Trust‘s EcoShop, 2 Forrester’s Lane, Te Aro, Wellington. Get the NZ-made Cuppa Coffee Cup at Hopper Home Eco Shop, 11 Hopper Street, Te Aro, Wellington City; Made-It, 103 Victoria Street, Wellington CBD; Cre8tiveworx, 217 Cuba Street, Wellington CBD; and Village Green, 14 Ganges Road, Khandallah. Get the made-in-Hutt Valley Ideal Cups at Wellworks Pharmacy, 75 Taranaki Street, Wellington. Locally made ceramic cups with silicone lid are sold at The Wellington Apothecary, 110a Cuba Mall, Wellington CBD. Get the very leak proof Frank Green cups at Iko Iko, 118 Cuba Street, Te Aro; and The Sugar Trade, 14 Collins Avenue, Linden. The Joco brand at Coffee 86, 86 Lambton Quay, Wellington; Cre8tiveworx, 217 Cuba Street, Wellington CBD; and The Gift Shack, 4/210 Main Road, Tawa. The SoL Cup at Hopper Home Eco Shop, 11 Hopper Street, Te Aro, Wellington City. Think Cup, similar to Joco, are sold at The Axe, 193 Adelaide Road, Newtown. Reusable lunch boxes or containers are great to have on you when you’re out and about in case you want to get takeaways, to carry leftovers home with you, or if you find food to forage. You can get Meals in Steel stainless steel lunchboxes and food containers at Commonsense Organics, 260 Wakefield Street, Te Aro; 37 Rongotai Rd, Kilbirnie; 96 Johnsonville Rd, Johnsonville; and Sustainability Trust‘s EcoShop, 2 Forrester’s Lane, Te Aro, Wellington. Gentleman’s Hardware aluminium reusable lunch tins can be purchased at Tea Pea, 22 Ganges Road, Khandallah. If you’re after a cutlery wallet to keep your reusable cutlery set in while out and about, you can find locally-made ones by Waste-ed at Hopper Home Eco Shop, 11 Hopper Street, Te Aro, Wellington City; and Sustainability Trust‘s EcoShop, 2 Forrester’s Lane, Te Aro, Wellington. Plastic shopping bags are a menace, but so too are those plastic produce bags for fruit and vege or the plastic bags often offered alongside bulk bins at bulk stores. You can avoid them by bringing your own bags or buying a set of reusable produce bags. For a great range of locally-made and/or 100% organic cotton produce and bulk bin bags check out Sustainability Trust‘s EcoShop, 2 Forrester’s Lane, Te Aro, Wellington and also Hopper Home Eco Shop, 11 Hopper Street, Te Aro, Wellington City. Otherwise, you can get 100% organic cotton produce and/or bulk bin bags by either Loot or Rethink at Commonsense Organics, 260 Wakefield Street, Te Aro; 37 Rongotai Rd, Kilbirnie; 96 Johnsonville Rd, Johnsonville; Good House Keeping, 287 Cuba Street, Wellington; and Natty, 476 Adelaide Road, Berhampore. V1 Vegan Store, 207 Cuba Street, Te Aro stocks locally made bulk bin bags by What the Vegan. For an alternative to a plastic shopping bag, get locally-made Boomerang Bags from Sustainability Trust‘s EcoShop, 2 Forrester’s Lane, Te Aro, Wellington. Say “no straw thanks” next time you order a drink out and either use your mouth to drink, or get yourself a reusable metal straw instead. If you’re keen on a reusable metal straw, you can get them from Hopper Home Eco Shop, 11 Hopper Street, Te Aro, Wellington City; Commonsense Organics, 260 Wakefield Street, Te Aro; 37 Rongotai Rd, Kilbirnie; 96 Johnsonville Rd, Johnsonville; Good House Keeping, 287 Cuba Street, Wellington; Sustainability Trust‘s EcoShop, 2 Forrester’s Lane, Te Aro, Wellington; Cre8tiveworx, 217 Cuba Street, Wellington CBD; and The Gift Shack, 4/210 Main Road, Tawa. Purchase at – Hopper Home Eco Shop, 11 Hopper Street, Te Aro, Wellington City; Commonsense Organics, 260 Wakefield Street, Te Aro; 37 Rongotai Rd, Kilbirnie; 96 Johnsonville Rd, Johnsonville (the Munch brand); Sustainability Trust‘s EcoShop, 2 Forrester’s Lane, Te Aro, Wellington; Good House Keeping, 287 Cuba Street, Wellington (Lily Bee Wrap brand); Iko Iko, 118 Cuba Street, Te Aro (Munch brand); Cre8tiveworx, 217 Cuba Street, Wellington CBD (Honeywrap brand); The Axe, 193 Adelaide Road, Newtown; Natty, 476 Adelaide Road, Berhampore; and The Gift Shack, 4/210 Main Road, Tawa. DIY – it’s way cheaper! You just need to get natural fibre fabric (cotton) and unpackaged beeswax. Keep an eye out at secondhand stores and fabric stores for off-cuts of cotton, or see if you can get some upcycled natural fibre fabric from Vinnies Re Sew, Mezzanine Level, St Vincent De Paul’s, 32 Rongotai Road, Kilbirnie or see whether there’s anything appropriate in the reject fabric bundles from the Curtain Bank (0n sale at Sustainability Trust‘s EcoShop, 2 Forrester’s Lane, Te Aro, Wellington). Get unpackaged beeswax at Commonsense Organics, 260 Wakefield Street, Te Aro; 37 Rongotai Rd, Kilbirnie; 96 Johnsonville Rd, Johnsonville; Good House Keeping, 287 Cuba Street, Wellington; 02b Healthy, 7 Johnsonville Road, Johnsonville; and The Wellington Apothecary, 110a Cuba Mall, Wellington CBD. Reusable sandwich bags – you can get Munch reusable sandwich bags and/or wraps from Hopper Home Eco Shop, 11 Hopper Street, Te Aro, Wellington City; Commonsense Organics, 260 Wakefield Street, Te Aro; 37 Rongotai Rd, Kilbirnie; 96 Johnsonville Rd, Johnsonville; Sustainability Trust‘s EcoShop, 2 Forrester’s Lane, Te Aro, Wellington; and Zealandia Store, 53 Waiapu Rd, Kārori. Silicone pot/bowlcovers – a good option for storing leftovers in a bowl (other than just putting a plate on top!) or as an alternative to tin foil for roasting (as the covers can withstand temperatures of up to 220 degrees and will also keep hot food warm when transporting). You can buy these at Vessel, 87 Victoria Street, Wellington CBD. You can find dishbrushes with wooden handles and removable + replaceable, home compostable heads at Hopper Home Eco Shop, 11 Hopper Street, Te Aro, Wellington City; Commonsense Organics, 260 Wakefield Street, Te Aro; 37 Rongotai Rd, Kilbirnie; 96 Johnsonville Rd, Johnsonville; Sustainability Trust‘s EcoShop, 2 Forrester’s Lane, Te Aro, Wellington; Good House Keeping, 287 Cuba Street, Wellington; Vessel, 87 Victoria Street, Wellington CBD; and The Axe, 193 Adelaide Road, Newtown. Also, you can get wooden veggie brushes with plant fibre bristles which can also be used as dishbrushes (they just don’t have a handle) at Cre8tiveworx, 217 Cuba Street, Wellington CBD; The Axe, 193 Adelaide Road, Newtown; and Commonsense Organics, 260 Wakefield Street, Te Aro; 37 Rongotai Rd, Kilbirnie; 96 Johnsonville Rd, Johnsonville – as these are made only of bamboo and plant fibre, they’re home compostable should they ever wear down. For something more like a traditional dishcloth sponge, check out the SPRUCE or Wet-it! 100% cotton + cellulose dishcloth sponges (home compostable at the end of their life) which are available at Commonsense Organics, 260 Wakefield Street, Te Aro; 37 Rongotai Rd, Kilbirnie; 96 Johnsonville Rd, Johnsonville; Good House Keeping, 287 Cuba Street, Wellington; Sustainability Trust‘s EcoShop, 2 Forrester’s Lane, Te Aro, Wellington; and Natty, 476 Adelaide Road, Berhampore. At The Axe, 193 Adelaide Road, Newtown; and Tea Pea, 22 Ganges Road, Khandallah you can get the fancy Bianca Lorenne cotton dishcloths. Alternatively, find 100% cotton cloths that can be used as dishcloths at The Wellington Apothecary, 110a Cuba Mall, Wellington CBD (subject to availability as they are handknitted by a local) ; Vessel, 87 Victoria Street, Wellington CBD; Good House Keeping, 287 Cuba Street, Wellington (also stocks 100% cotton/rayon cloths); and Tea Pea, 22 Ganges Road, Khandallah. If you’re after a coarser scrubby, you can get 100% coconut fibre coarse scrubby from Commonsense Organics, 260 Wakefield Street, Te Aro; 37 Rongotai Rd, Kilbirnie; 96 Johnsonville Rd, Johnsonville. You can also order lovely 100% organic cotton dishcloths from Vida Textiles. They’re based in Brooklyn, Wellington and are happy for you to arrange a time with them to pick up your order yourself (to save on postage waste). Hopper Home Eco Shop, 11 Hopper Street, Te Aro, Wellington City – stocks a range of locally-made, natural cleaning products (both powdered and liquid) by Figgy & Co which you can fill into your own bottles. Even better, when the stores bulk dispensers are empty they get returned to Figgy & Co for refill – so it’s really low-waste! Commonsense Organics, 260 Wakefield Street, Te Aro; 37 Rongotai Rd, Kilbirnie; 96 Johnsonville Rd, Johnsonville – stocks a range of liquid cleaning products you can fill your own bottles with. Good House Keeping, 287 Cuba Street, Wellington – stocks a range of Ecostore liquid cleaning products on tap that you can refill your own bottles with. Eco Planet and Next Generation laundry powder both come in a cardboard box with a cardboard scoop – no plastic lining! You can get one or the other (or both) from New World Wellington City, 279 Wakefield Street, Wellington; New World Thorndon, 150 Molesworth Street, Thorndon; New World Newtown, 195 Riddiford Street, Newtown; Pak’nSave Kilbirnie, 98 Rongotai Road, Kilbirnie; Four Square Hataitai, 1 Moxham Avenue, Hataitai; New World Newlands, corner of Newlands Road and Bracken Road, Newlands; and New World Tawa, 35 Oxford Street, Tawa. Soapnuts – natural nut shells that release saponin (like soap) in water and can be used for laundry. Once spent, the shells can be composted. Hopper Home Eco Shop, 11 Hopper Street, Te Aro, Wellington City stocks the SoapNuts NZ brand that come only in a cardboard box with no inner plastic lining. Non-plastic clothes pegs – Go Bamboo pegs available at Sustainability Trust‘s EcoShop, 2 Forrester’s Lane, Te Aro, Wellington; New World Tawa, 35 Oxford Street, Tawa; and Commonsense Organics, 260 Wakefield Street, Te Aro; 37 Rongotai Rd, Kilbirnie; 96 Johnsonville Rd, Johnsonville. The Axe, 193 Adelaide Road, Newtown – sells bars of laundry soap that come with a natural fibre/wooden scrubbing brush (all packaged only in a strip of paper and two cotton ties). They also sell a general household cleaner version so you can avoid buying various cleaning products in plastic bottles. Baking soda – available unpackaged in bulk bins at Hopper Home Eco Shop, 11 Hopper Street, Te Aro, Wellington City; Commonsense Organics, 260 Wakefield Street, Te Aro; and Moshim’s Foodmart, 2-6 Wilson Street, Newtown. Hopper Home Eco Shop, 11 Hopper Street, Te Aro, Wellington City stocks a variety of other DIY cleaning/bathroom products ingredients, so go in and have a look around! Essential Oils – get your refills of essential oils (as well as other products) at The Wellington Apothecary, 110a Cuba Mall, Wellington CBD. Bamboo toothbrushes – a great alternative to plastic toothbrushes because they have wooden, home compostable handles (though bristles are still plastic and need to be removed from the handle and put in a rubbish bin). You can find bamboo toothbrushes at Hopper Home Eco Shop, 11 Hopper Street, Te Aro, Wellington City; Commonsense Organics, 260 Wakefield Street, Te Aro; 37 Rongotai Rd, Kilbirnie; 96 Johnsonville Rd, Johnsonville; Sustainability Trust‘s EcoShop, 2 Forrester’s Lane, Te Aro, Wellington; The Wellington Apothecary, 110a Cuba Mall, Wellington CBD; Foursquare Kelburn, 97 Upland Road, Kelburn; New World Thorndon, 150 Molesworth Street, Thorndon; Good House Keeping, 287 Cuba Street, Wellington; V1 Vegan Store, 207 Cuba Street, Te Aro; New World Wellington City, 279 Wakefield Street, Wellington; and Wellworks Pharmacy, 75 Taranaki Street, Wellington. Dental Floss – Hopper Home Eco Shop, 11 Hopper Street, Te Aro, Wellington City; Good House Keeping, 287 Cuba Street, Wellington; Commonsense Organics, 260 Wakefield Street, Te Aro; 37 Rongotai Rd, Kilbirnie; 96 Johnsonville Rd, Johnsonville; Sustainability Trust‘s EcoShop, 2 Forrester’s Lane, Te Aro, Wellington; and The Wellington Apothecary, 110a Cuba Mall, Wellington CBD all stock Do Gooder floss, which comes in a refillable glass tube with a screw on metal lid. The WHITE floss is made of 100% silk and is home compostable (the black, bamboo and activated charcoal floss has polyester in it so is landfill only). When you run out of the floss, no need to get a new dispenser, you can get refills of the floss in a cardboard box from all stockists listed above – just pop the refill into your original metal/glass dispenser. Toothpaste – natural toothpaste powder available unpackaged in bulk bin (BYO container) at Hopper Home Eco Shop, 11 Hopper Street, Te Aro, Wellington City. At Wellington Apothecary, 110a Cuba Mall, Wellington CBD you can get a variety of natural toothpastes made by Kerikeri company Nature Body, which come in glass jars that you can return to Nature Body, when empty, for sterilisation and refill. Hopper Home Eco Shop, 11 Hopper Street, Te Aro, Wellington City (locally made by Underground Soapery). Many places stock the popular Ethique range which includes shampoo bars, conditioner bars, shaving bars, deodorant bars, moisturiser bars, etc. (all of Ethique‘s bars come in home compostable packaging): Commonsense Organics, 260 Wakefield Street, Te Aro; 37 Rongotai Rd, Kilbirnie; 96 Johnsonville Rd, Johnsonville; Sustainability Trust‘s EcoShop, 2 Forrester’s Lane, Te Aro, Wellington; V1 Vegan Store, 207 Cuba Street, Te Aro; Cre8tiveworx, 217 Cuba Street, Wellington CBD; Wellworks Pharmacy, 75 Taranaki Street, Wellington; and Farmers, 206-218 Lambton Quay; and 46-54 Bay Road, Kilbirnie. If you’re into an all-in-one bar, you can get the Global Soap Shave, Shampoo and Body bar made with beer (:-D) from Commonsense Organics, 260 Wakefield Street, Te Aro; 37 Rongotai Rd, Kilbirnie; 96 Johnsonville Rd, Johnsonville; and Sustainability Trust‘s EcoShop, 2 Forrester’s Lane, Te Aro, Wellington. Check out local company Underground Soapery who make shampoo bars (among other things) – you can buy their products online, at Hopper Home Eco Shop, or find them at one of the markets in the Wellington region. You can get shampoo and shaving bars by Marlborough company Jeymar Soap & Body from Commonsense Organics, 260 Wakefield Street, Te Aro; 37 Rongotai Rd, Kilbirnie; 96 Johnsonville Rd, Johnsonville. Nature Body deodorant in compostable cardboard tubes sold at The Wellington Apothecary, 110a Cuba Mall, Wellington CBD. If you’d like to get unpackaged natural deodorant in bulk straight into your own containers, you can get this at Hopper Home Eco Shop, 11 Hopper Street, Te Aro, Wellington City. Menstrual cups – stocked at Hopper Home Eco Shop, 11 Hopper Street, Te Aro, Wellington City; Commonsense Organics, 260 Wakefield Street, Te Aro; 37 Rongotai Rd, Kilbirnie; 96 Johnsonville Rd, Johnsonville; Sustainability Trust‘s EcoShop, 2 Forrester’s Lane, Te Aro, Wellington; V1 Vegan Store, 207 Cuba Street, Te Aro; Unichem Cuba Mall, 122 Cuba Mall, Wellington; Madame Fancy Pants, 225 Cuba Street, Wellington CBD; Wellworks Pharmacy, 75 Taranaki Street, Wellington; New World Wellington City, 279 Wakefield Street, Wellington; and New World Thorndon, 150 Molesworth Street, Thorndon. Reusable, washable pads are available at Hopper Home Eco Shop, 11 Hopper Street, Te Aro, Wellington City; and Sustainability Trust‘s EcoShop, 2 Forrester’s Lane, Te Aro, Wellington. Avoid plastic shavers that are designed to be disposable and go for 100% metal razors that will last you decades and only require the 100% metal and recyclable blades to be replaced (or sharpened with a leather strop! ), and remember to use a bar of shaving soap instead of shaving foam that comes in an aerosol can (see above) – note, you’ll need a shaving brush to make this work. You can buy razors, replacement blades, shaving brushes, and even leather strops from Lambert’s Luscious Men’s Grooming Specialists, Shop 214, Left Bank, 116 Cuba Street, Wellington. Or else if you’re just after a shaving brush, you can also get these from Commonsense Organics, 260 Wakefield Street, Te Aro; 37 Rongotai Rd, Kilbirnie; 96 Johnsonville Rd, Johnsonville; The Wellington Apothecary, 110a Cuba Mall, Wellington CBD; Cre8tiveworx, 217 Cuba Street, Wellington CBD; The Axe, 193 Adelaide Road, Newtown; or Newlands Pharmacy, 33 McMillan Court, Newlands. Hopper Home Eco Shop, 11 Hopper Street, Te Aro, Wellington City sells a few cosmetics/toiletries in bulk that you wouldn’t find just about anywhere else without packaging – e.g. deodorant, blush, zinc sunscreen, and more! Cotton Buds – Go Bamboo makes home compostable buds so you can avoid the single-use, unrecyclable plastic ones. Get them from Commonsense Organics, 260 Wakefield Street, Te Aro; 37 Rongotai Rd, Kilbirnie; 96 Johnsonville Rd, Johnsonville; Sustainability Trust‘s EcoShop, 2 Forrester’s Lane, Te Aro, Wellington; V1 Vegan Store, 207 Cuba Street, Te Aro; Good House Keeping, 287 Cuba Street, Wellington; and Foursquare Kelburn, 97 Upland Road, Kelburn. Toilet Paper – Commonsense Organics, 260 Wakefield Street, Te Aro; 37 Rongotai Rd, Kilbirnie; 96 Johnsonville Rd, Johnsonville stocks Greencane toilet paper (which comes in fully home compostable packaging). Hopper Home Eco Shop, 11 Hopper Street, Te Aro, Wellington City stocks Smartass toilet paper (also packaging in fully home compostable packaging). The Wellington Apothecary, 110a Cuba Mall, Wellington CBD store stocks a lot of unpackaged, base ingredients that can be used for making your own cosmetics including refill options for oils (such as almond oil, argan oil, jojoba oil, etc. ), organic essential oils, beeswax, cacao butter, epsom salts, and a large range of clays. Just BYO bottles and containers and ask for them to be filled! Baking Soda is an essential ingredient in lots of homemade toiletries such as toothpaste and deodorant, as well as just a great general cleaner when teamed up with vinegar. You can get it unpackaged in bulk from Hopper Home Eco Shop, 11 Hopper Street, Te Aro, Wellington City; Commonsense Organics, 260 Wakefield Street, Te Aro; 37 Rongotai Rd, Kilbirnie; 96 Johnsonville Rd, Johnsonville; and Moshim’s Foodmart, 2-6 Wilson Street, Newtown. Hopper Home Eco Shop, 11 Hopper Street, Te Aro, Wellington City stocks heaps of ingredients for DIY cosmetics/toiletries in bulk bins and they also run workshops on making these kinds of products, so definitely go down to the store, check it out, and ask for recipes! Hiya Imogen – yes, apparently there’s a guy at the Dixon Street Sunday Market who has a store selling noodles and tofu. All pre-packed at the stall, but if you leave him with a clearly labelled container, he’ll take it back with him and put your order of tofu in and bring it to the next market (so you need to be organised a week in advance to drop your containers off with him). Kia ora, any recommendations as to which bulk bin shops listed above are most affordable? We’re making the switch from the supermarket but don’t want our food bills to go up. Cheers! Hopper Home Eco Shop is the most zero waste bulk bin store in Wellington, so we recommend shopping there from a waste reduction perspective. Their food is mostly organic and NZ-grown and it’s very affordable in light of that, and much cheaper than commonsense bulk bins. They also have a loyalty stamp card so you reduce your costs over time. Otherwise the bulk stores in Newtown are cheapest – Moshim’s is very affordable and they have had the best bulk bin range in Wellington for a very long time.